The witching hour is almost upon us, ghouls. Halloween is just around the corner and I have to say, it’s one of my favorite days of the year. All the girls dress up in their most revealing outfits and all the people like me try to think of the costume that will involve the least amount of money/work. But not everyone is into dressing up and I can respect that. Some nights are best spent indoors. So if you are planning on hiding from the inevitable Lady Gaga barrage that we are likely in for on the 31st, there is hope for you. GamePro concocted The Gamer’s Horror Game Guide, a list which gives you plenty of spooky games to play, no matter what platform you have. 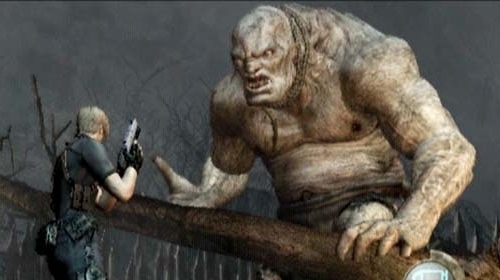 Personally, Fear 2 and Bioshock are my creepiest games, although Resident Evil 4 did have some moments that left me pale. I’ve never played Silent Hill, but I’ve heard of it freaking people out. What games do you play when you want to send chills up your spine? Has any game so unnerved you that you had to stop playing for a while? Are you going to play anything scary on Halloween? Boo! I heard that Call of Cthulhu game for the Xbox was pretty freaky. All the recent Myst talk reminded me how eerie that game was too. I havent played many horror games, but like you said Bioshock was pretty creepy… Peggle? Bioshock? Come now, Anthony. And I think FEAR 1 was better in the scare factor because it used the “blood everywhere” horror gimmick less, although that elementary school was pretty creepy. I would have to go with Dead Space and Alan Wake most recently, both of which very different types of horror and both great games. Ooo, Call of Cthulhu: Dark Corners of the Earth was pretty creepy! Especially during that level on the ship with all the deep ones coming after you. Everything I’ve read about Amnesia: Dark Descent sounds awesome, as do the Penumbra games that came before it. Actually, I think Fallout 3 could be really scary. When you had to go into those dark subway tunnels early in the game when you were low on ammo and still relatively weak, there was always a “oh, god, I hope there’s nothing down here with me” feeling to the experience. That feeling went away after you became more powerful, but it was creepy while it lasted. OH! That section in Uncharted 1 where you have to go down into the basement of that old fortress while all those subhuman, mutant things are coming after you was pretty damned scary. Reminded me of the old Resident Evil games, only I could actually move my character. I’d have to rank Dead Space as the hands-down scariest game I’ve every played, though I have to admit to a history of chickening out of games from Silent Hill to Fatal Frame to Clive Barker’s Undying. Maybe I’ll finally take a stab at RE4 Wii this halloween – it’s been waiting on my shelf for way too long. Dead Space has to be up there as one of the scariest, Don’t think I ever finished it. I’m actually surprised that Doom 3 didn’t make it on there. Sure, it’s an older game, but playing that in the dark with a nice pair of headphones on on Nightmare is exactly what I’ll be looking forward to doing come the next few days. Hmn, horror. Not my strong suit when it comes to games or movies (ESPECIALLY movies, I simply don’t watch scary ones). I’ve played and loved Resi 4 and Dead space though, so I guess they are exceptions to this rule but, IMO, Dead Space wasn’t really THAT scary. Left 4 Dead isn’t so much scary as it is exhilaratingly nerve-racking. There are many moments when I’m all alone and I’m being stalked by a Hunter or Smoker with nothing but my pistols. It handles the dramatic fluctuation between intense action and eerie anticipation very well, even though it does involve a lot of yelling, explosions, and rat-tat-tat, but I just never try to categorize it as a creepy dark corner horror game.